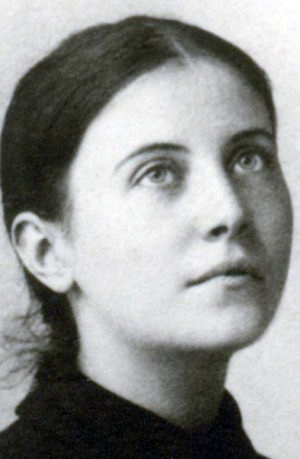 This prayer before confession was written by St. Gemma Galgani, pictured above, who was an extraordinary mystic and stigmatist. St. Gemma was born in Italy in 1878 and died fairly young at age 25, yet she displayed such holiness that she was canonized by the Church in 1940. My crucified God, behold me at Your feet. Do not reject me, a poor sinner, as I appear before You. I have offended You much in the past, my Jesus, but in the future I resolve to sin no more. My God, I put all my sins before You. I have considered them and realize they do not deserve Your pardon. But I beg of you to cast one glance upon Your sufferings and see how great is the worth of that Precious Blood that flows from your veins. My God, at this hour close Your eyes to my want of merit and open them to Your infinite merits. Since You, dear Jesus, have been pleased to die for my sins, grant me forgiveness for them all, that I may no longer feel their heavy burden, which presses me to the earth. My Jesus, help me, for I desire to become good, no matter what it may cost. Take away, destroy, root out completely all that You find in me that may be contrary to Your holy Will. At the same time I beg You, O Jesus, to enlighten me, that I may be able to walk in Your holy light. Although St. Gemma has been called “the Passion Flower of Lucca” (which was the town in Italy where she lived) her life was no bed of roses! Her mother died when she was 8 and her father passed away when she was 19. Thus, she grew up helping to raise her 7 brothers and sisters, and she experienced poverty firsthand for a time after her father’s death before going to live with relatives. Gemma also developed spinal meningitis when she was just 20. She was cured of this condition miraculously in March 1899, as she herself claimed, through the intercession of St. Gabriel Possetti, who had died of consumption in 1862. These trials didn't diminish her love for Jesus nor her desire to help the poor, which she often did with loving acts of charity. She wished to become a nun, but her frail health kept this from happening. Nonetheless, it didn't keep her from becoming a saint! Gemma experienced the Divine and supernatural presence in a very special way as a mystic. She would converse with Jesus, often in mystical trancelike states we call ecstasies. Her Guardian Angel visited her frequently as well, as did our Blessed Mother. Our Lord had a special task for her, to become what is known as a victim soul, one who is chosen by God to bear a great deal of suffering in reparation for the sins of mankind. He once told her “I need souls who, by their sufferings, trials and sacrifices, make amends for sinners and for their ingratitude”. Indeed, Gemma understood this calling quite well when she wrote in a letter of her desire to be Christ’s victim, “in order to atone for my innumerable sins, and if possible, for those of the whole world”. Victim souls have a special mystical bond with our Lord. They include in their ranks such illustrious figures in our faith as St. Padre Pio, St. Faustina, and Sister Josefa Menendez. Like them, Gemma was often harassed by the devil, who tried to keep her from snatching souls from him by her suffering and sanctity, souls that would otherwise be bound for Hell! After one very intense mystical vision, on June 8, 1899, Gemma first received the stigmata, the Five Wounds of Christ, out of which blood would flow. She would continue to receive them periodically from Thursday evenings into Friday afternoons. She also suffered wounds from a mystical crown of thorns. She bore all this for the most part in loving solidarity with our Lord in his Passion, suffering for souls with dignity and grace. Yet such was Gemma’s love for our Lord that she once wrote of herself in a letter that “Gemma alone can do nothing. But together Gemma and Jesus can do all things!" Gemma never wished to draw attention to herself nor her extraordinary life! Fortunately for us, however, she wrote an autobiography in 1901, at the request of her Spiritual Director, Father Germanus, which included her descriptions of her supernatural experiences and encounters.She wrote letters to him about them and kept a diary as well. Gemma died of tuberculosis on Holy Saturday of 1903 in a peaceful death that followed much pain. If you’d like to read more about her, we recommend this excellent website. We hope her story, her humility and her devotion to Jesus as shown in her prayer above can inspire you to greater sanctity as well. If this seems like too tall an order, just remember this: if saints such as St. Gemma can be humble enough to turn to God for help in dealing with their sinfulness, so can any of us! Humility and trust in God are key virtues for us to adopt on the road to Heaven.